Your loft is either lined or open such that you can see the whole structure. The latter is still the most common, although more and more people are undertaking loft conversions. This is the insulation of the ceilings of the uppermost floor from above. If your loft space is not used except for water storage tanks and services, then you have a simple job to insulate between the joists. Most people in this situation already have some form of loft insulation, but if you are installing from scratch lay 150mm or 200mm of insulation depending on what you have space for. If you have less than 100mm, it is worth topping it up; otherwise work on other areas of the house first and come back later when you can afford to. The main prin­ciple to follow here is to cover over any pipes or tanks that contain water, as the air temperature above the insu­lation can go below freezing. If the rafters are open and unplastered, it is a simple matter to place sand­wich insulation boards on the inside and fix plasterboard underneath. This method of insulation reduces the room height and may inhibit the thickness of insulation possible. You may want to add insulation between the rafters as well, to increase the thickness of insulation. In this case, it is necessary to leave a gap of 50mm between the insulation and the roofing felt, to allow the rafters to breathe. This may well determine the thick­ness of the insulation possible. There is an advan­tage if at least one of the insulation boards is covered with a layer of aluminium foil to add to the effective­ness of the insulation. It is also necessary to place a vapour-proof barrier be­tween the insulation board and the plasterboard. If your attic space is already lined, and you do not want to go to the trouble of removing it (and headroom is not crit­ical) the insulation could be placed directly on the underside of the lining. 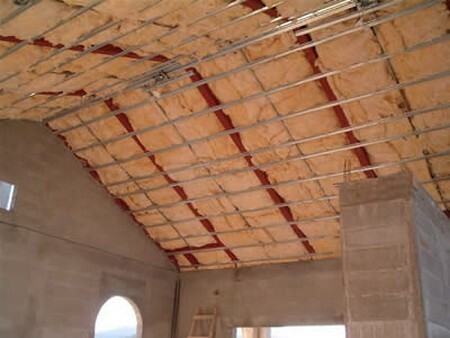 This is the most usual place to install the insulation: the main problem here is often that the rafters are not deep enough to accommodate a reasonable thickness of insulation. However, with this method it is possible to increase the depth of the rafters by adding a lath underneath each of them to what­ever thickness is necessary to allow the 50mm gap between the insulation board and the roofing felt. For example, if you have a rafter of 75mm depth and you want to add 50mm of insulation board, you could attach a lath of about 25mm underneath. The same would apply with the silver foil and the vapour-proof barrier. This particular option is only worthwhile if you are having your roof renewed. It is also the most compli­cated method because it al­most certainly involves the redesign of the eaves to allow for the added thick­ness of insulation. The basic principle is to strip the roof of tiles and tile laths, to lay a rigid insulation board on top of the rafters (with a vapour-proof barrier in between) and then lay a building board or roofing laths on top of this to attach the tiles or slates. It may be necessary to employ an architect or someone who can competently produce details of how the construction at the eaves can be altered. This type of insulation enhancement is likely to become much more common in the future, and with routine construction details being developed for the eaves, it will allow almost any thickness of insulation to be installed on the roof.